The Infamy, the first episode for Assassin’s Creed 3: The Tyranny of King George Washington DLC, features Connor once again as the protagonist and his story continues after the events of AC3. (If you haven’t played AC3 yet this review does contain spoilers from here on) However everything but Connor has changed in this world so even though his story is continuing it seems to be taken place in an alternate reality. If you’re perplexed about this, Connor is just as perplexed when he’s woken up by his mother because of an emergency. Connor is ecstatic to see her because she was killed when he was just a young boy in an attack on his village. Connor’s mother, oblivious to why he’s so happy to see her again, tells him they have to rush because there are soldier’s attacking a nearby town. Apparently they’re trying to find a woman who tried to steal the source of George Washington’s power and only succeeded in making him want to attack the local areas. 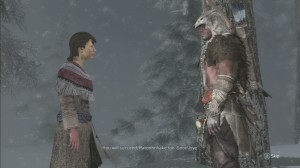 After fighting off some of the advancing soldiers and rescuing people in the area Connor and his mother come face to face with George Washington except this isn’t the same one from AC3, this one is a king with no memory of Connor and it was Connor’s mother who attempted to steal the mad king’s power. It’s up to you, well, as Connor of course, to get to the bottom of what’s going on and put a stop to the mad King George Washington who somehow possesses an Apple of Eden. Succeed in figuring out what’s going on? After the initial cutscene to open the game you’re immediately running after your mother for your first mission. And you’ll have to do alot of running in this episode especially in the beginning. The controls are the same and you have the same weapons as AC3 for the most part however any upgrades or weapons you added during that campaign aren’t available to you here. You’re basically starting off from scratch and even though you’re an assassin, in this new reality you’re not viewed as an assassin by others or associated with that order in the minds of others. So you start off without the signature hidden blades and don’t receive them until after first mission. That doesn’t mean there isn’t any action to start off because there’s plenty of action in this DLC. Since the soldiers are following the orders of a mad king, who most likely has extra influence over them due to the Apple of Eden, to apparently be as brutal as possible, you’re never incognito during this episode. This changes the gameplay slightly from AC3 because you’ll have to either rely on stealth alot more or enter into open combat any time you encounter a patrol. So this isn’t just on missions in restricted areas, this is also in the open world travelling from one location to another. (You can avoid travelling by using fast travel to go from one objective to another). You encounter George Washington early in this episode and he’s a straight up badass. He has a scepter containing an Apple of Eden and he knows how to wield it. So no one stands a chance against him. Not you, not your mother or anyone that has come up against him. This episode doesn’t reveal how he was able to get this or why the events in this world are so drastically different from the events that took place in AC3 so Connor’s appeals to Washington as a friend falls on deaf ears. Since you’re hopelessly outmatched a series of events ends with you agreeing to drink tea from the leaves of this Willow tree that puts you into a trance-like state. This gives you two new abilities after coming into contact with your animal spirit, the wolf. The first is the wolf cloak, which makes you imperceptible to human senses but at the cost of your health being drained(can still be detected by dogs). The second is the wolf pack, which sends 3 spirit wolves to attack nearby enemies without you being detected. 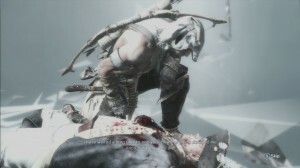 I really liked these new abilities and even though they were much different from the abilities of the assassins in all the games it was perfectly tied into Connor’s heritage and tribe. And you’ll definitely need these abilities to succeed in the missions in this episode. And as one who wished AC3 had more interactions between Connor and his tribe I did appreciate this. 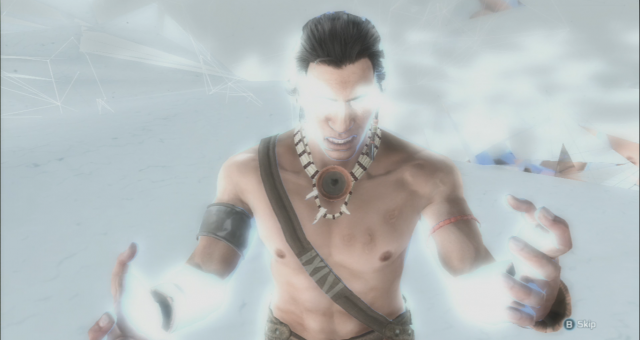 However it doesn’t just translate to new abilities, all the missions in this episode dealth with Connor and his tribe or rescuing Native Americans who were capture and being transported as slaves. With the way episode 1 ended I would assume there would be less focus on that in episode 2. For the first entry in a three-part series it left me more interested in what the next two episodes have to offer. I feel it would have been good if more was revealed in this episode about how this alternate reality occurred but I’m sure that will be answered in the remaining episodes. The two new abilities are great additions and never got tired of using either of them. I wasn’t sure going into this if George Washington would be a memorable antagonist but after seeing him and the scepter my doubts are gone. I’m hoping the glitches are gone in the next episode and it’s more polished because it unnecessarily detracts from game play. And with the way this episode ended it’s an interesting starting point for episode two. If you thoroughly enjoyed AC3 and always wanted to see more of Connor interacting with his tribe you might get some satisfaction from this episode. The story line is interesting and the new abilities are dope. If you disliked AC3 or found certain things to be frustrating the glitches in this one might end up leaving an even worse taste in your mouth. I’m a fan of the Assassin’s Creed series so as of now I want to see where this story line goes.